Congratulations! You made an excellent decision to explore Thai Massage through our free introductory video series. You can access your first video at the bottom of this page. Your second video will arrive tomorrow. Here are a few facts you might want to know about us. I am the founder and director of Thai Healing Massage Academy, and I’ve been living in Thailand, the homeland of Thai Massage, for well over a decade. I have been practicing and teaching Thai Massage for 18 years. My Thai wife is also a Thai Massage teacher and therapist. Thai Healing Massage Academy is one of the top providers of online Thai Massage education. We specialize in high quality online training courses for Thai Massage and other related massage styles. We are located in Chiang Mai, Thailand, the foremost center for Thai Massage education in the world. The Thai Healing Massage system is a set of unique massage styles that take Thai Massage to a totally new level. It includes proprietary training that is not available anywhere else, like Thai Rocking Massage and many other advanced therapeutic applications. Thai Healing Massage Academy courses are approved by the National Certification Board (NCBTMB) for continuing education credits in the USA. Our video training makes it possible for anyone, anywhere in the world, to receive a high quality interactive massage education at an affordable cost right in their home, with an option to become certified by Thai Healing Massage Academy. I teach all courses myself, and I provide personal support to all our online students worldwide via email, skype or forum. Students find this easy access to me a valuable feature which normally does not exist in massage home study programs. For your orientation, all our training courses are listed on the left side of this page for easy access. As a subscriber to our videos you also get access to our private facebook Thai Massage group with lots of great interaction and information. And now, enjoy the first module of your free Thai Massage introductory video series. Thai Massage and Thai Yoga Massage are essentially the same thing. Here in Thailand it is called ‘Thai Massage’, or ‘Nuad Boran’. The term ‘Thai Yoga Massage’ was invented by westerners and is mostly used outside of Thailand in western countries. Here in Thailand traditional Thai Massage has never changed much, but many westerners have added and modified techniques. Therefore Thai Massage in western countries can look a little different from what you see in Thailand. But still in essence it is the same thing, just different personal styles of various practitioners and teachers. The term ‘Thai Yoga Massage’ is actually a better description of this modality since it does originally come out of the yoga tradition. Quite a few western Thai Massage teachers have a background in yoga as well, and they like to emphasize the connection between the two systems. I place importance on this connection in my writings as well. Like many teachers, I have developed my own style, and I call it ‘Thai Healing Massage’. But regardless of the name, it is all the same family of bodywork with some modifications and adaptations. Even here in Thailand there are regional differences in the way Thai Massage is practiced. Ultimately you just have to find a teacher whose style resonates with you. There is no one right way to practice Thai Massage. It is a healing art that continues to grow and expand because of many creative and inspired practitioners who develop their own styles. Thanks Vera, I am glad you like it! I definitely will take the full training course. ASAP. Please let me know what is the next step to be enrolled. Of course you can go at your own pace. That’s the whole idea of our online courses. Wonderful, thanks for imformative free video. I like the techniques that you have share with us. I just want to say i very like it your video, and i want to say that your homestudy courses are very through and you are very clear teaching style, very easy to understand. Thank you Marzilah, I am happy to hear that you like my training material. Thanks for your free video.I hope I could meet you in Thailanld once, it would be great pleasure to take a picture with you. If you can come to Thailand one day, I would be happy to meet you here! Hi, Shama,How did you get your name? You look a western man to me to have a Thai name. Anyway, I’m glad you have an online course with a free video to start. In this way, all our questions or doubt in mind can be answere easily. Although I just watch your first video, I find it very interesting and educational. I would like to enrol in your course not to make some extra money ( but if there is opportunity, why not ) mainly for my family circle. My question is, do you have a payment plan while undergoing or learning the course? Yes, there is a split pay option for the Complete Thai Massage course, where you can split the payment into two installments 30 days apart. Do you have any page on Facebook? Ola Shama!! Maravilhoso, delicado, sutil, gostozo e facil para mim assimilar todos os movimentos por conta da fisioterapia e a massoterapia no qual me dedico a 22 anos. Ja estou de prontidao esperando pelo segundo video. Ate la!! Ola Maristela, de hecho no hablo Portugues, pero hablo Espanol. Puedo leer el Potugues, pero ni lo hablo ni lo escribo. Me imagino que entiendes mi Espanol:) Que bien que te gustan mis videos, y gracias por tu comentario. Donde vives tu? I’m glad to see you who are not the thai person , but you represent thai massage very well. I’m curious !! 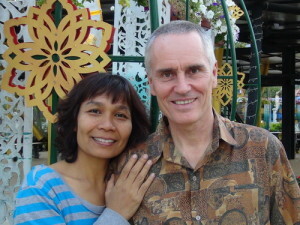 Can you speak thai since you have lived in Thailand and married to a beautiful thai woman? Yes I do speak some Thai, not fluently but enough to get by. It’s great to see a Thai person in here! I represent Thai Massage very well since I have been in Thailand for 14 years and this has been my profession for all this time. My wife is a Thai Massage therapist also. We actually met in a massage shop in Chiang Mai 10 years ago. Thanks for your informative free video on explaining the difference between Western and Thai Massage. I have been to Thailand several times(Khon Kaen); Mukdehan, across from Laos and to Bangkok several times. Thai people are beautiful. I am Polynesian (Samoan) and my spouse is American (Norwegian/German). In Hawaii as you might imagine, there are many types of massages. The only massage that helps my husband’s lower back severe pain is THAI MASSAGE. Being a Christian, I embrace christian beliefs and values I find your videos very helpful and that you have a God given gift to bless others. Being a nurse,I am thinking about taking your course in the future to help my husband and others. Once again, thank you. I am glad you like my free course. You are right, Thai Massage can be a powerful healing modality if applied skillfully. Just like your husband, countless people have back issues. I have had many such clients and have had very good results with my style of Thai Massage. Actually I have produced a highly in depth and specialized Thai Back Massage therapy course which is totally unique. My main course, Complete Thai Massage, contains lots of back work already, and my Thai Back Massage course takes it even further. If you ever decide to join one of our courses, I am looking forward to assisting you in helping your husband get better. wonderful, thank you. I like the techniques that you have shared with us . Thank you for the free video course! I can tell already that your home study courses are very thorough and you have a very clear teaching style. I will definitely be purchasing your Complete Thai Massage Course in the next year. Looking forward to learning more! Wow.First time I have listened about beautiful Tailand.I think so Tai is famous for massage. I am impressed & will come thailand some days. Its very useful. im very much Interested to learn Thai massage.It is very helpful and easy to learn Thank you very much. You are definitely in the right place. You will find out about options for learning Thai Massage in the coming free video modules. After watching your mini course I realize that I’ve been practicing all of the techniques described in your video through Swedish massage. So glad I found your website, Thank you. You are gifted in what you do, your demostrations kn the bideos are making more anxious on learning more. keep up your goodwork and god bless you to continue helping people around the world gain knowledge from your experience. Thank you, Naz, for your kind comment. It was challenging at first .I did a lot of online browsing. I know, in some areas people have this misconception which is really strange. Why would a Thai person do a better Thai Massage than a non-Thai? There are lots of excellent western Thai Massage practitioners and teachers. Not only that, the fact is that most of the innovation and creative adaptation of Thai Massage in the last 15 years or so has all been done by westerners. Thai Massage in Thailand has remained traditional without any change. However there have been very interesting developments outside of Thailand. Personally I have added quite a few elements to my style of Thai Massage which have proven to be very effective and well received. Examples are extensive rocking techniques, yoga principles like breathing, attention to excellent ergonomics, many abdominal techniques which are generally lacking in Thai Massage, more focus on therapist-friendly techniques without overusing the thumbs, and more. Inspiring and gentle teaching/presentation. Thanks a lot! Do you reside in Chiang Mai or teach there on certain months of the year? Yes, I live in Chiang Mai. However Thai Healing Massage Academy is not a live public massage school. We focus on providing first class online training all over the world. There are plenty of Thai Massage schools in Chiang Mai already. So we help those people all over the world who cannot come to Chiang Mai to study, and we have developed a very successful online teaching method. Thank you this was very informative since I had no knowledge of what thai massage was or different it is from other modalities. Hi Sharma, thank you so much for the informative videos. I never knew Thai Massage was so different to the other massages. Hi Rose, thanks for sharing that. I am glad that you are getting something out of it. Thank you! I “send” you all the energy and positive magnetic fields of Crete Island/Greece where I live to you, as a minimum thanks to what you did and provide, hoping to start your on-line sessions begining 2017 that I plan to. Thanks once again for sharing your knowledge, your love for Thai and truth! Thank you Elina. I am looking forward to working with you when you start the online sessions. Thank you for sharing the basics of Thai massage. I was a active massage therapist for 8 years. Recently I have decided to continue with massage but would like to offer just Thai massage to my clients.I experienced my first Thai massage while in school and loved it! I am looking forward to continue to learn and signing up for you complete Thai massage course soon. Thank you! I am looking forward to assisting you in making the transition to a full time Thai Massage practice! Thai Massage sure is different. It opens up a whole new world of working and relating to massage therapy. Thanks Jennifer, and welcome to our community! thank you for this great effective video. I really appreciate sharing it. Thank you for the video! I feel like Thai Massage is just the thing for me as I enjoy energy work. This made me feel more confident about purchasing the course! Raffik, if you keep watching this video series, you will get lots more information about Thai Massage. The stretching of the hamstring I found to be particularly useful in alleviating lower back pain. My sister complained of lower back pain and I performed tithe hamstring stretch on her. She commented at the end that she felt like she could walk freer and her hips were freer. Thank you for all the information in this video! Hi, Shama! I didn’t have a clue about Thai Massage was about. But after seeing your video I’m all about Thai Massage! But my question is: since I have zero experience/knowledge as a massage therapist of any kind, can I enroll in The Complete Thai Massage course? If not, what would you recommend? Thank you. Hi Cris, let me ask you a couple of questions. Are you planning to learn Thai Massage to start a career as a Thai Massage therapist, or more as a hobby to help friends and family? Do you have any related background like yoga or any healing arts? Most of our students are either massage therapists or yoga teachers, or they have some background in the healing arts. This is the ideal situation for an online course. However we do have some students who started the Complete Thai Massage course without any prior massage experience, and they did well with it. It is preferable to have some massage or yoga background, but it can and has been done without it. So if you instantly fell in love with Thai Massage, and you feel attracted to my style of teaching and this course, then I don’t see anything wrong with giving it a try. The Complete Thai Massage course has a 30 day guarantee, so if it doesn’t work for you, there is this one month period during which you can decide if this is for you or not. Coming back to my previous question – if you would decide to become a professional Thai Massage therapist, then there might be other steps which you might have to take depending on where you live in the world. Thank you so much for your conscious teaching. I have just been receiving Thai massage, I live in Keaau, Hawaii, I will be moving to Minneapolis, Minnesota, hopefully within 6 months. I will be able to study Thai massage there at Big River Yoga, I am 74 years old and have been through cancer treatment, it has been a solitary journey as I have no family. I have cousins in Minneapolis who will be supportive of me, I have been on a healing journey for a very long time, and the Thai massage has really resonated with me, I believe I have finally found the passion of my life, your videos will help prepare me for the study there. Thank you for your wonderful intuition and consciousness. Thank you for this feedback, I am so happy to hear how much you resonate with Thai Massage and that these videos are helping you! Thank you for information in this video! Thank you Mr. Shama for your excellent free video part 1, looking forward to the other modules.You are an excellent instructor! very clear concise video on thai massage techniques! thank you for having this forum for viewers all over the world!